Castleberry Hill is a neighborhood in central Atlanta, located southwest of the Central Business District. It has been a federally recognized historic district since 1985 and became a City of Atlanta Landmark District in 2006. A designated landmark district helps preserve the neighborhood from overzealous developers. The area also contains the Castleberry Hill Historic Art District. Parking: Several parking lots are available in the area. MARTA: Take the South Line to the Garnett Street stop. Take the escalators up to Trinity Avenue, walk left, cross Spring Street, and you will be on Peters Street. 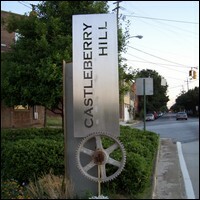 Take just a short walk up the street, and you are in the Castleberry Hill Neighborhood.